Quebec Premier Francois Legault walks in as his government is about to table a legislation on laicity of the state, Thursday, March 28, 2019 at the legislature in Quebec City. Legault walks by the crucifix that will also disappear if the legislation is passed. Waves of condemnation washed over Quebec’s move Thursday to ban some public-sector workers from wearing religiously symbolic articles, despite Premier François Legault’s attempt to pacify the issue with a grandfather clause exempting current employees who stay in the same job. The Legault government introduced draft legislation that would ban select public employees, including schoolteachers, from wearing crosses, head scarves, turbans and other visible items of religious importance. Moments after the bill was tabled, the Coalition Avenir Québec government introduced a motion to remove the crucifix from the main chamber of the National Assembly – if the draft law passes. The motion received unanimous support. The quarrel over the religious-symbols law, months before an expected federal election, comes amid ongoing fights between Ottawa and the Quebec governments over infrastructure spending and the possibility of allowing the Quebec revenue agency to collect federal income taxes. 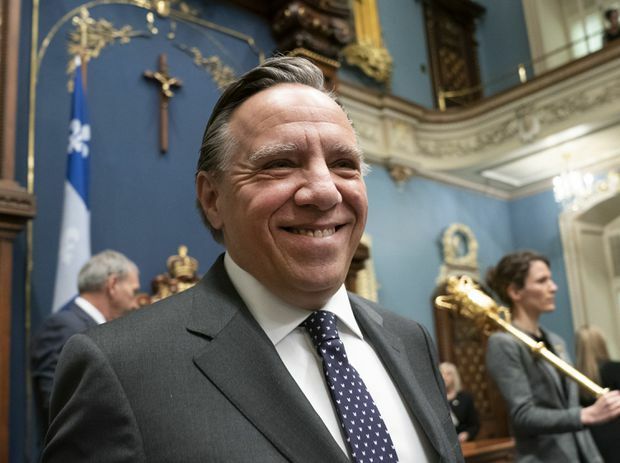 Mr. Legault has said he hopes the law and the motion will enshrine the separation of church and state and end 15 years of acrimonious debate about the place of religion in Quebec. Early returns suggest conflict with Ottawa, religious minorities and the city of Montreal may instead be his future. The Quebec-born Ms. Nazha says her headscarf is part of her identity and she would never remove it. Nancy Nazha, a third-year special education student at UQAM university in Montreal, is from Lebanon and wears a hijab. She is concerned about the law tabled by the Quebec government that would ban Muslim veils and other religious symbols among teachers. The National Council of Canadian Muslims called the legislation discriminatory and regressive. Executive director Ihsaan Gardee said the timing of Quebec’s law was troubling. “We’re concerned about how it might embolden people who already hold racist or hateful views to act out on them,” Mr. Gardee said in an interview. He noted that the legislation comes only two weeks after the mosque shooting in New Zealand that killed 50 worshippers, and two years after the Quebec City mosque attack that claimed six lives. Online hate is also on the rise, he said. The draft law, which is likely to pass with Mr. Legault’s party holding the majority of seats, includes a clause that would allow current employees to keep jobs and religious symbols, as long as they stayed in the same post. Mr. Legault said he was proud of the bill and the motion to remove the crucifix, which marks a major departure from recent Quebec history. For nearly 15 years, Quebec legislators refused to move the cross – an artifact Maurice Duplessis installed in 1936 to illustrate the partnership between church and province. Daniel Baril of the Mouvement laïque québécois, which previously fought to stop Saguenay city council from praying to start sessions, applauded the government for starting the process of removing the crucifix and taking steps toward government religious neutrality. However, Mr. Baril said the law should not have contained a grandfather clause and should have been extended to all public employees and subsidized institutions. The bill includes provisions to amend the Quebec Charter of Rights and to invoke the notwithstanding clause of the Constitution to preserve the law from challenge under the Canadian Charter of Rights and Freedoms. The bill adopts a law passed by a previous Quebec Liberal government dictating that people must provide services with faces uncovered by veils. Courts suspended the Liberal law last year. The CAQ version would face no such court hurdle with the constitutional override. Simon Jolin-Barrette, the Quebec minister carrying the file, faced a battery of questions about how the law would apply. While it covers public grade school teachers, it does not touch staff or faculty in public daycares, universities or colleges. It’s not clear what sanctions administrators who refuse to apply the law would face. Dreadlocks and tattoos with religious significance are not banned, he said, because they are part of the body. Wedding rings are allowed along with a crucifix under clothing. “You’ll understand there will be no strip searches in the morning to check,” Mr. Jolin-Barrette said. The Legault government, elected in October, hopes to pass the law by the end of June.